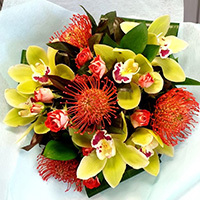 If necessary, should demand exceed supply,Tussie Mussie Flowers reserves the right to substitute flowers, foliage or container of equal or more value. 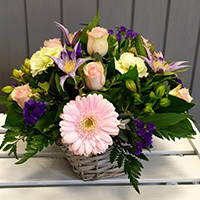 This timeless basket of Guernsey days gone by, alstromeria, carnations, little tea roses and clematis are presented alongside Germini and statice in Mother’s day favourite colours of pink, lilac and white, you will be “simply cherished” with this gift for mum! 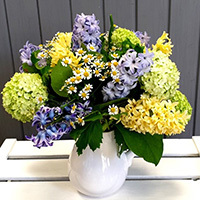 All the joys of Spring, traditional blue and buttermilk hyacinths are joined with viburnum and daisies which lift the colours together. 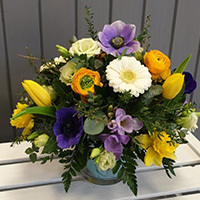 All presented in a ceramic jug which can be used time and time again, mum will be over joyed with this thoughtful gift. 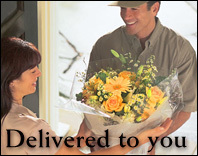 Mother’s Day classic pink is show cased in force. 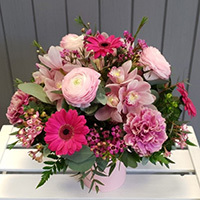 Bright pink Germini are combined with unusual two tone carnations, amazing Ranunculas and soft cymbidium orchids which are long lasting, like the memories you will with your Mum, finished off with pink bouvardia and waxflower displayed in a pink ceramic pot! 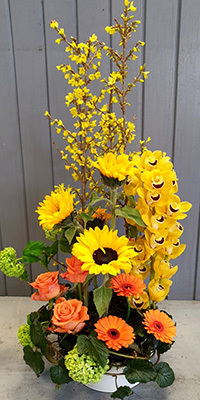 Bring some warmth to your mum’s heart with this bright, vibrant and striking Modern display of sunflowers, stunning yellow orchid, orange roses and Germini presented in a lovely cream zinc container, forsythia and viburnum keep this seasonally Spring. 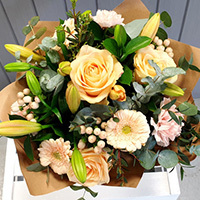 You can’t go wrong with a bit of sunshine. 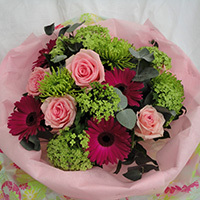 This feminine bouquet of roses, chrysanthemum, viburnum and vibrant gerberas in shades of pink and green and presented in pink and printed wrap, this is certain to make your Mum’s day!